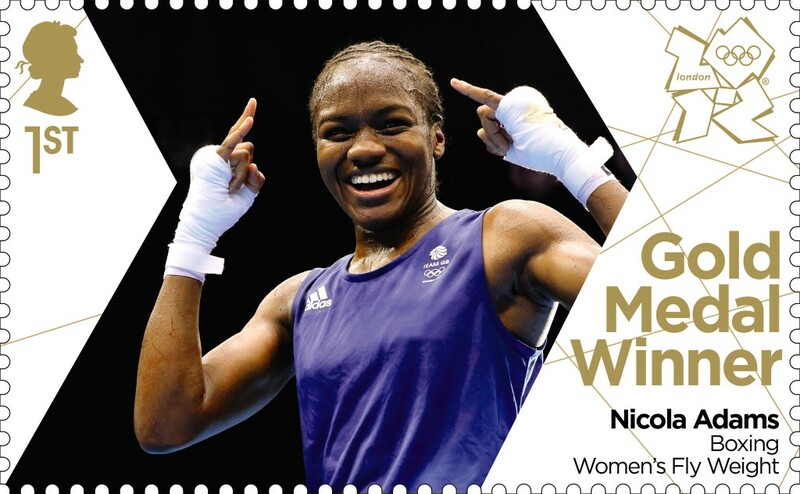 After a blank day yesterday, two more gold medals for TeamGB today, so two more stamps. 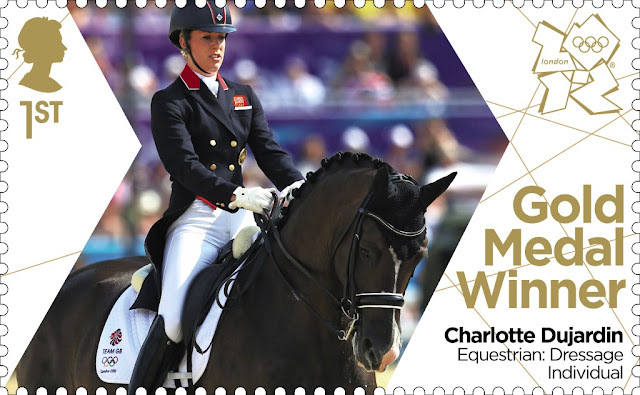 Charlotte Dujardin won Britain's second dressage gold medal of the Olympics, on Valegro, as the host nation's equestrian team finished London 2012 with three titles. Laura Bechtolsheimer took bronze to add to the British overall total. Then Great Britain's Nicola Adams became the first female boxer to win an Olympic gold medal, outclassing Chinese great Ren Cancan in the flyweight final, taking Britain's gold tally to 24. 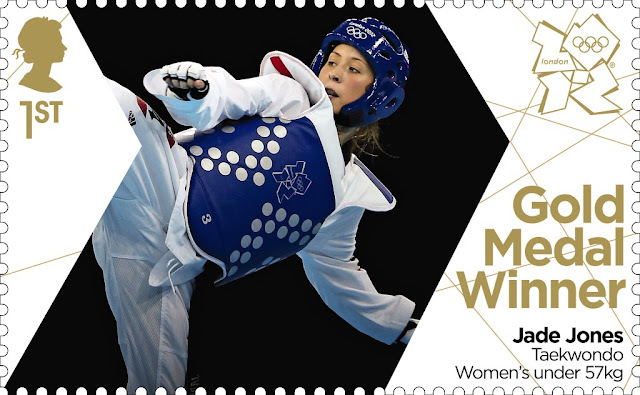 Jade Jones claimed Britain's first Olympic taekwondo gold medal and the hosts' 25th of the London Games. The 19-year-old beat Yuzhuo Hou 6-4 to take the women's -57kg title. ...and Jade Jones makes it three Golds for team GB today and 25 overall for the Games. Proportionally, that would mean that Team GB would be on 126 Gold Medals if we had the same population as the United States! And if Grenada had the same population as us, they would have 562 gold medals. Sadly it doesn't really work that way. are these stamps available to buy as a collection, or as singles yet? 25 miniature sheets would cost £90 - I don't have that sort of cash. Rob, yes. Please visit http://www.norphil.co.uk/catalog/product_info.php?products_id=3507 and 'buy' there. It's really a registering of interest - with no commitment - as we still don't know how many there will be (and hence how much they will cost). If someone submitted a cover to Tallents House with another boxing stamp on it - to commeorate the Irish Boxing Gold medal - would they postmark it? Royal Mail will not cancel foreign stamps. If you had an Irish FDC (or stamp on any cover) and added the British stamp then (a) Tallents House would apply the Flag FD postmark to the British stamp; or (b) you could send it to a Handstamp Centre for one of the other (multi-date) postmarks which are running - see our website, Olympic & Paralympic Welcome pages. Royal Mail will not cancel covers with two different datestamps for the same date, but they will cancel different (British) stamps on one cover with up to 2 different dates (but not three). No the cover had a 15p boxing stamp and a second class machine (both British stamps) - will it get the union jack postmark? No - the flag postmark is only available for the gold medal stamps. Had my covers back from Talents House, and yes they did put the union jack postmark on my cover for the Irish Gold Medal (with a 15p boxing stamp and a second class machin) - is this the Post Office breaking their own rules. Would you like me to send you a copy of it? Well Rob you have a nice souvenir. I don't know whether they 'broke their own rules' - postmarks with the words 'First Day of Issue' can only be applied to new stamps (of course), and they had indicated that this would be the case. OTOH they have been very busy, and it is easiest just to apply the postmark and send it on rather than send it back with a letter explaining why you can't have it!